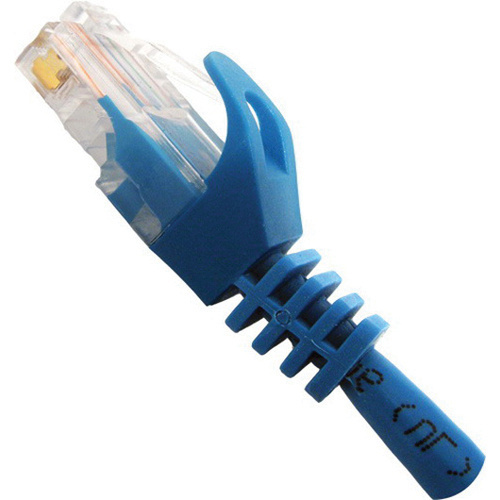 Vertical Cable 24/4P UTP Mold-injection snagless Cat 6 patch cable has 8P/8C gold-plated pin RJ45 terminal connection. The bare copper conductors of this cable ensure optimal signal conductivity. This cable has blue flame-retardant PVC jacket to withstand harsh environmental conditions. Bare copper cable has 100% Beldfoil® aluminum foil-polyester tape shielding that reduces EMI/RFI interference/crosstalk. This 5-ft cable has outside diameter of 5.8 +/-0.2 mm. Cable is UL listed, RoHS compliant and exceeds ANSI EIA/TIA 568 B.2-10 standards.